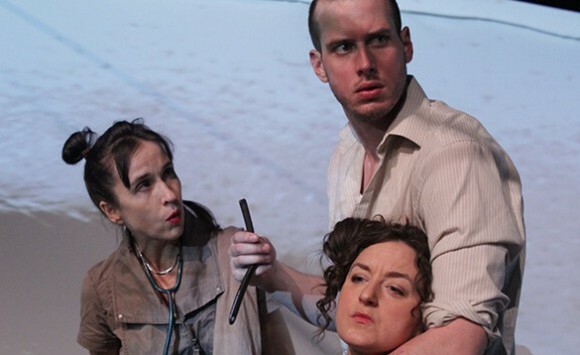 Examination of Woyzeck’s tormented soul a bit of a headache in Third Wall’s Woyzeck’s Head. In Third Wall Theatre’s first professional production in two years, James Richardson takes us inside the head of the troubled and tormented Woyzeck. We see Woyzeck as a soldier. We see Woyzeck undergoing medical experimentation. We see Woyzeck jealous of his lover’s growing closeness to an attractive drum major. What we don’t see, or at least what I missed, was the thread weaving those individual lines together. Without that thread, the individual elements were so disconnected from one another so as to create a lack of cohesion and an antipathy for even being in the theatre. Leaving things open to interpretation is valid. Seeking to push an audience to think and make their own connections is valid. Staging to keep an audience at arms distance from connecting to the main character is valid. But here, now, and especially when it comes to that third one, it didn’t work for me. In the end, in my antipathy, I was simply left wondering why? Why care? Nothing in this show answered the (to me) important question of why should I care about this guy, why do I want to be in his head, and why does this warrant my attention? All that said, I do want to commend Drew Moore, Kristina Watt, Katie Bunting, and James Richardson for their work. The performances and staging were clean and sharp and powerful for it. Their commitment to the piece is without question. Katie Bunting is one of my new favourite people after her work here. Plus, the attention to detail and vision that were present and made me fall in love with Richardson’s Marat/Sade last year were equally present in Woyzeck’s Head. The presentation of Woyzeck confined to such a small space combined with the projections and aforementioned performances made a potent combination. So then, why did it all just fall superbly flat for me and feel more like the mechanical execution of a military parade than it did a living breathing piece of theatre? That oft passed around cliché comes to mind: he just didn’t get it. Well, if that’s what it is, I’ll own it. I know that I did not get it and I am fine with that assessment. But that’s just one person’s opinion and I’d love to know what you think. What did I miss? Or was it me at all? You tell me. Join the discussion in the comments below.